Welcome to my home page. There are many facets to these pages, and they keep on changing. 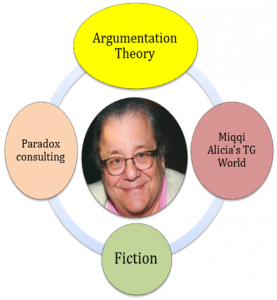 The major facets are philosophy, transgenderism, fiction, and my consulting business, Paradox Communications. Each represents a major aspect of my life and work. Please feel free to explore them-maybe you can figure out how they all fit together. Each section provides an overview of my work and activities in one of my several areas. These areas may all seem separate, bifurcated and distinct, but they are not. There are connections at many levels and in more ways than I can ever realize. All these facets are happening in one person, one mind, one body, and just as those are all ways of viewing the same being, so are the facets of my work all the ways of viewing the same life. So, choose the facet you would like to visit by clicking on one of the links in the circle or on the menu bar, and enjoy.